The Consumer Electronics Show (CES) was back in Las Vegas to celebrate its 50th edition surrounded by a new wave of gadgets to add to the Internet of Things library, drones, robots and even a smart bed. Also, a new round of innovation promising to change FinTech and the core of the financial industry forever. This is due to what a more mature Blockchain technology will bring: new payment systems that will expand international commerce, support financial inclusion and create new forms of e-commerce, making it faster and transnational. It will also revolutionise the banking system starting from its core, with some Central Banks exploring and adopting digital currencies across markets that will share its will with traditional currencies. CES also witnessed the unveiling of another rising technology, CarTech. The 50th anniversary edition of the Show was also the most important for the car industry, with 11 tier-one auto suppliers and more than 300 vehicle-tech related exhibitors. Major industry players like Mercedes, Ford, BMW, FCA and Volkswagen showed off new automotive tech ranging from self-driving systems and electric cars to new user interfaces. We reached out to some of the top influencers on our list to ask them for their views on CES 2017. We spoke to Jim Harris (#1), Evan Kirstel (#5), Marsha Collier (#13), Lauren Goode (#16), Anne Munition (#21) and Gary Shapiro (#25). Be sure to follow them to stay up-to-date on the best content and resources about Consumer Electronics! CES is one of the biggest Consumer Electronics Shows in the world. This year, the show celebrated its 50th anniversary, for these reasons we were very interested in seeing which social influencers and brands were leading the Consumer Electronics Show 2017 discussion. In order to identify these social influencers and brands we first looked at the CES conversation, and as Twitter remains the best platform for its open data policies we started by extracting over 400K Tweets from 17th December 2016 – 10th January 2017 mentioning the key words: (“CES 2017” OR CES17 OR CES2017 OR “Consumer Electronics Show”). We then added these tweets and accounts into our database, categorized and curated by hand a top 100 list of influencers and brands ranked on a combination of the 4 Rs (Resonance, Relevance, Reach and Reference). These accounts were then added into our Influencer Relationship Management software (IRM). Below you can see a network map of the conversations with the number one influencer Jim Harris at the centre. Be sure to click on the map to enjoy the full size network diagram in greater detail. Below you can see another network map created with in IRM showing the number 1 brand Intel at the centre. If you are interested in learning more about identifying, managing and engaging with influencers click here to get in touch! The most popular topic mentioned in Tweets and blog posts by CES top 100 brands and influencers was Fintech with a 21% share of voice, illustrating how a conjunction between startups, innovation and technology is reshaping the Financial Industry. Artificial Intelligence was the second most popular topic, receiving 17% of all mentions among the top influencers and brands due to an increasing interest in Intelligent Assistants, IoT, Big Data and Machine Learning. Another growing Industry theme, Internet Of Things was the third the most popular topics with a 14% share of voice. A larger number of devices carry chipsets and sensors that allow them to be connected to the Internet and collect useful data that customers and companies can use to measure how good or bad they perform in a certain activity. For example, smartwatches and smart wristbands have gone mainstream in the last three years, with millions of runners, cyclists and swimmers using them to monitor physical activity. Big Data was fourth receiving a 9% share of voice. There were several conferences on how Big Data “hits the education sector” and data scientists building the equivalent of Internet in 1995. This is growing sector for new businesses as some experts forecast that an average person will generate 1.5 gigabytes of data per day by 2020 and a car 4 gigabytes. This shows the growing importance of Data in IoT and the new consumer electronics products. Blockchain, a technology promising to go mainstream in 2017 and to change forever how the global financial services industry works by bringing new payment and e-commerce services and removing international barriers that will boost commerce, also achieved 9%. Startup was also mentioned in the 9% Tweets and blog posts. 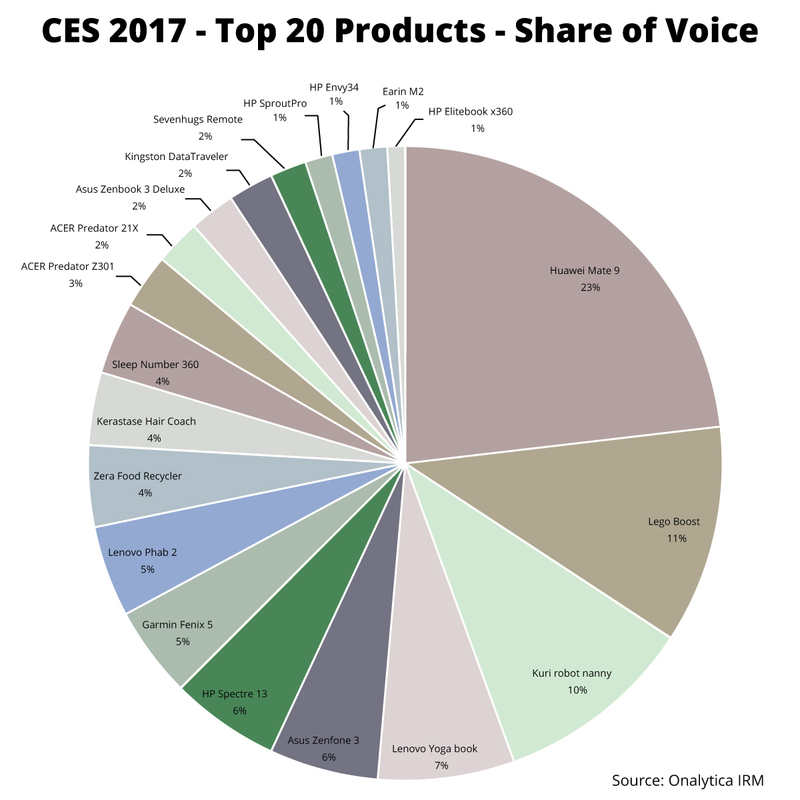 CES is one of the biggest Consumer Electronics Shows in the world and one of the most important showcases for hundreds of new businesses to show their products, services and ideas. 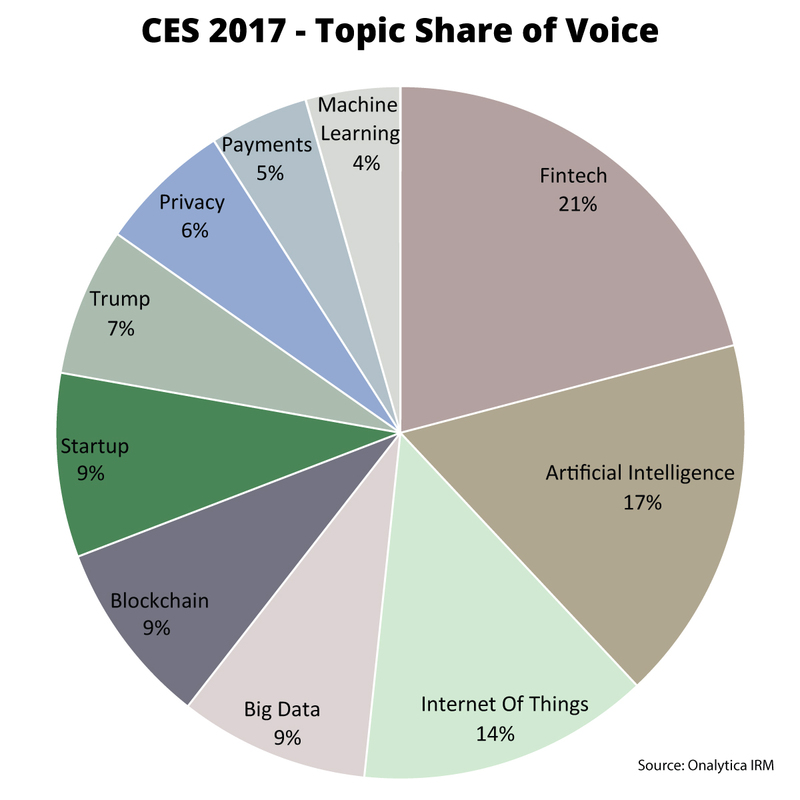 Donald Trump was also a big topic at CES 2017, receiving 7% of all mentions, due to the uncertainty the 45th President of the USA is raising in key areas such as regulation, policy, business tax or US government spending. As more and more gadgets and services are connected to the Internet these days a growing number of datasets has become available online and a growing number of people is concerned about Privacy. Data scientists and other professionals discussed in conferences and roundtables the best way to share data online and how to standardise it by maintaining a solid privacy standard. This topic collected a 6% share of voice. Payments, gained over 5% of all Tweets and blog posts due to the new payment methods and other novelties that FinTech and Blockchain will bring to International Payments and E-commerce. 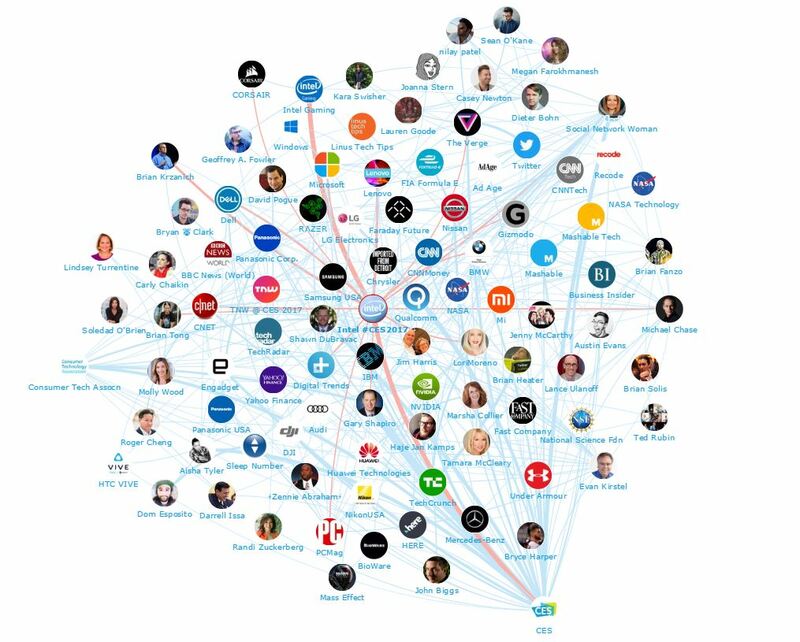 Finally, Machine Learning, strongly related with Big Data and IoT, summed up 4% of all mentions among the top 100 CES 2017 influencers and brands. After looking at the most commented topics during CES 2017 we checked tech most popular brands. Thanks to the huge interest in the new intelligent assistants, Amazon Echo, Google Home and Apple, home, these three american brands were mentioned in more than 60% of the engaged Tweets and blog Posts. Tech, digital and new media covered broadly Echo, –one speaker with voice control connected to Alexa – and this is why Amazon received 21% of all mentions on Twitter and blogs. Rumors linked to Apple developing a similar device with Siri as Smart Assistant, made the Cupertino brand second in our list with 20% of all mentions. Google was third with 19% of all tweets and blogs with mixed reviews on their new Google Pixel smartphone, comparisons between Google Home and Amazon Echo and some Android allusions by journalists commenting new devices. Samsung was fourth with 10% of all mentions. There was a big amount of media rumors around the new Samsung S8 look, materials and components after their profits have plummeted to a nine year low. Microsoft was fifth with 7% of all commentaries and Intel was sixth receiving 5% of all tweet and blog commentaries. LG achieved 4% followed by Sony with 3%. Finally, Lenovo, Dell and Huawei were mentioned in 2% of all Tweets and blog posts published by our top 100 brands and influencers. Although not being part of our most engaged topics, some tech magazines like Mashable predicted the rise of chinese brands as one of “the 10 tech trends that will rule CES 2017”. Brands like Hisense, LeEco and TCL hosted major events and released new products, mainly TV, that compete on tech and price with traditional Consumer Electronics Brands like Sony, LG, Philips, and Samsung. They join smartphone brands, like Huawei, Oppo and Xiaomi that compete now with the most established brands for sales in all market segments. Some brands, like Huawei, are now european market leaders in countries like Spain, where the medium and low range of the market are really important, and they sell more than Apple or Samsung. 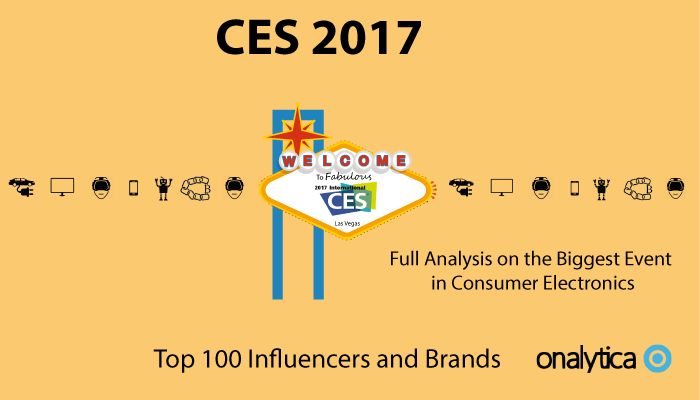 Finally, after checking the Top Topics and Brands at CES 2017, we also checked which products were mentioned the most on Twitter and Blogs among the top 100 influencers and brands. For this reason, we tracked a list of 60 products awarded by the Consumer Technology Association under the Best of Innovation category. The most popular innovation at CES 2017 was the Huawei Mate 9 which achieved 23% of all mentions on Twitter and Blogs. The second one was Kuri Robot Nanny was mentioned in 10%, meanwhile the new Lenovo Yoga Book, third, received 7%. Forth were the version of the Asus Zenfone 3 and HP Spectre 13 with 6% of all mentions. Garmin Fenix 5 and Lenovo Phab 2 were sixth, being commented in 5% of all Tweets and blog posts. After these established products ranked three innovative appliances, Zera food Recycler, Kerastase Hair coach and Sleep Number 360, with 4% of all mentions. 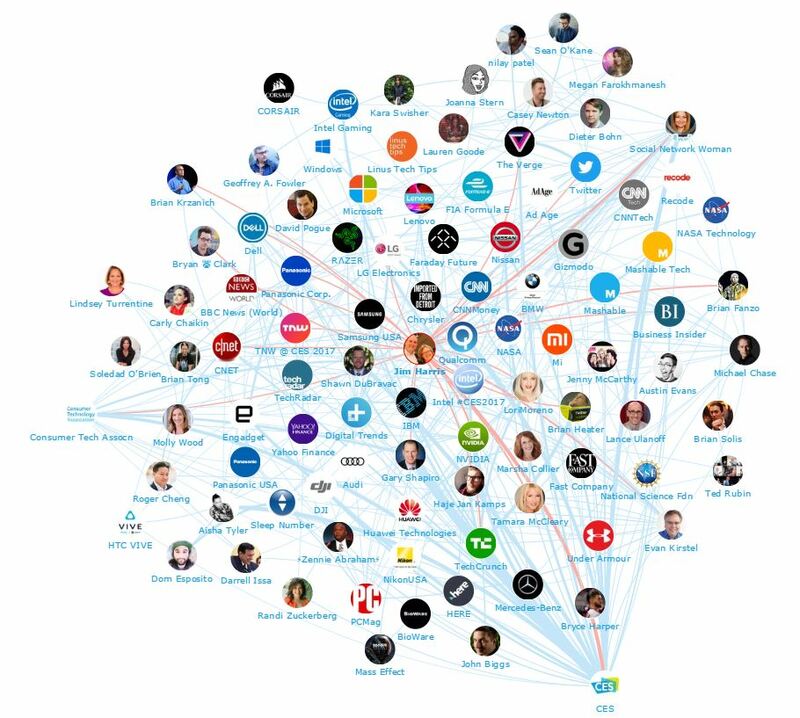 Below is a list of the top 50 influencers talking about CES 2017 on Twitter. If you want to see who ranks from 50-100 be sure to download the full report by clicking the download button below! 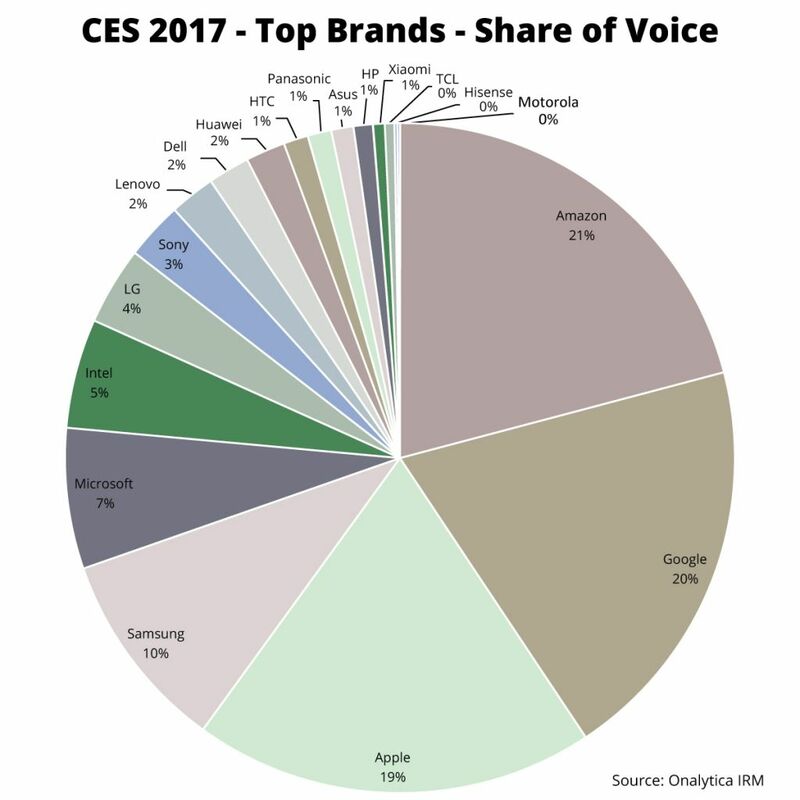 Here is a list of the top 50 brands talking about CES 2017 on Twitter. If you want to see who ranks from 50-100 be sure to download the report to get the full top 100 list! Disclaimer: As ever with these lists, it must be stressed that the ranking is by no means a definitive measurement of influence, as there is no such thing. The brands and individuals listed are undoubtedly influential when it comes to driving discussion around CES 2017.